For When The ‘Golfing Gods” Test You!! Gentlemen (And Women), Start Your Engines. Is FORMULA-E the future of motor racing? Mounted Snapper Jaws – A Great Catch Memento! The EV Industry – Are you ready for it? Ferrari Challenge is the widest ranging and most envied one-make series in the world, and when you see what is on offer, it’s easy to understand why. Established in 1993 (and FIA approved), the Ferrari Challenge was initially created for budding race drivers that owned the 348 Berlinetta. The event proved to be so popular that nowadays, it’s separated into three series events, Europe, North America and Asia-Pacific and has three categories per race, Trofeo Pirelli, Trofeo Pirelli AM and Coppa Shell. Each ‘meet’ is a weekend filled with high-performance Ferrari’s (both on and off the track), high-drama and ultimate luxury. The impressive motor racing is made even more so when you realise that these are not professional drivers on the track, simply owners that have a yearning in their hearts for motorsport glory – in other words, Gentleman (and women) Racers. Twenty-six ‘amateur’ drivers from fourteen countries (two of which are from New Zealand this season) compete in the Asia-Pacific series of the Challenge, each of them behind the wheel of identical 488 Challenge Ferraris. This is no mean feat as each Ferrari possesses a beast of a 3.9L turbocharged V8 engine producing 493kW and 761Nm and the most powerful Challenge car ever. It’s an ‘arrive and drive’ scenario, so while the drivers rest in the Challenge Suite being lavished with fine food and massages, all vehicle race preparation and maintenance is being ably conducted by Ferrari’s Corse Clienti. Since all participants drive the identically spec’d vehicle, the races are usually very close, which is the main appeal of this series, but drivers also get to enjoy driving on some of the most famous tracks in the world. All three series have excellent schedules, with races at Monza, Mugello and Silverstone in Europe; Laguna Seca, Montreal and Austin in North America; and in Asia, Melbourne, Shanghai, Fuji and Hampton Downs. 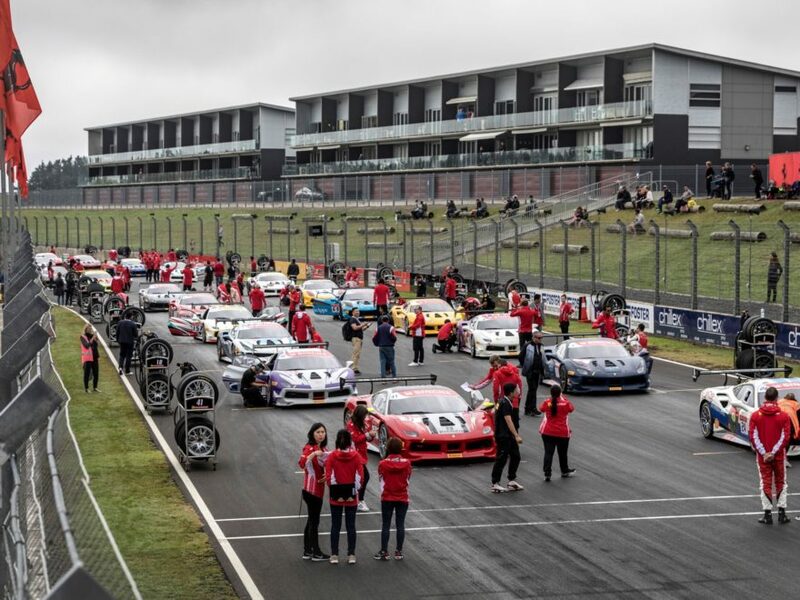 Yes, you heard that correctly, in April this year (for the first time ever) Hampton Downs Motorsport Park in the Waikato played host to this prestigious event and to the delight of Ferrari Challenge participants and the Ferraristi alike, it became a sea of Rossa Corsa. All this globetrotting and celebrity style motorsport does come at a price though. Aside from the purchase price of the 488 Challenge Ferrari plus ancillary expenses, it’s estimated that in North America, each race weekend can cost upwards of US$20,000 – which, when you consider what goes into making this series so epic, seems pretty reasonable to us. Next stop for the Asia-Pacific series is Suzuka in August, followed by Singapore Marina in September and culminating with the Finali Mondiali at Monza Italy in November. Fingers crossed it will return to New Zealand next year. Previous Post:Mounted Snapper Jaws – A Great Catch Memento! Want to recieve a copy of Marketplace by mail?